A member of the Iraqi government forces walks next to a pipeline at the Bai Hassan oil field, west of the multi-ethnic northern Iraqi city of Kirkuk, on October 19, 2017. Iraq said on Saturday it was increasing oil exports from the southern Basra region by 200,000 barrels per day to make up for a shortfall from the northern Kirkuk fields. The output from Kirkuk fell this week when Iraqi forces took back control of oilfields from Kurdish fighters who had been there since 2014. The increase in Basra exports keeps Iraq’s total output within the quota agreed with the Organization of the Petroleum Exporting Countries (OPEC), the oil ministry said in a statement citing Oil Minister Jabar al-Luaibi. He said 200,000 barrels per day would be shipped from Basra on top of the usual volumes exported daily of more than 3.2 milllion barrels. “These additional volumes will be produced until the northern oil output goes back to its previous level,” he said. In comments made later to reporters in Baghdad, he expected Kirkuk output to return to last week’s level “very soon”. An oil ministry official told Reuters on Thursday Iraq would not be able to restore Kirkuk’s oil output to last week’s levels before Sunday because of missing equipment at two of the largest fields of the region, Avana and Bai Hasan. Until these shutdowns, the northern oil region exported about 530,000 barrels per day, of which about half came from the semi-autonomous Kurdistan region and the rest from the disputed Kirkuk province, claimed by both the Kurds and the Iraqi central authorities. A shipping agent monitoring crude arriving from northern Iraq to the Turkish Mediterranean export terminal of Ceyhan said flows were unchanged from Friday, at 213,000 bpd. The crude exported from Ceyhan is carried by a pipeline across Iraqi Kurdistan and then Turkey. Kurdish Peshmerga forces deployed in Kirkuk in 2014, when the Iraqi army fled in the face of an advance by Islamic State militants. 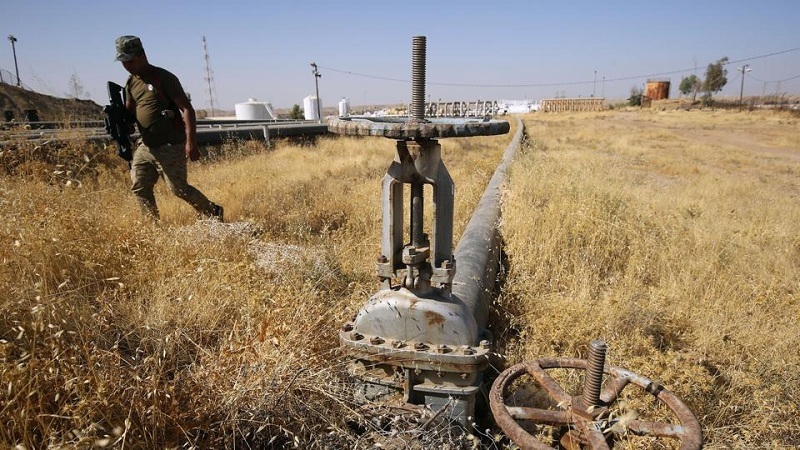 The Kurdish move prevented the militants from taking control of the oilfields. Iraq said on Saturday it was increasing oil exports from the southern Basra region by 200,000 barrels per day to make up for a shortfall from the northern Kirkuk fields. The output from Kirkuk fell this week when Iraqi forces took back control of oilfields from Kurdish fighters who had been there since 2014.